Ellipse provide the fastest laser IPL hair removal machines on the market and can treat skin types I -VI. A special HR-D+ applicator is suitable for skin type III – VI. Owing to Ellipse’s square pulse technology and dual mode filtering hair removal be Ellipse systems is practically pain free in contrast to many laser treatments. How does the Ellipse I²PL treatment work? Melanin converts the light energy into heat. 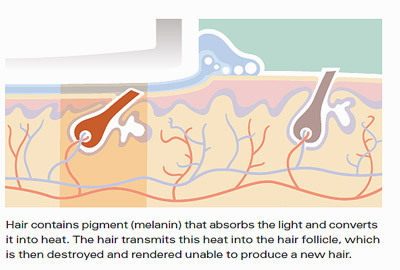 This heat is transferred to the hair follicle, which is destroyed, making it unable to produce a new hair. Hair in the resting (telogen stage) are treated later. The treatment is only effective on growing hairs as these are still attached to the follicle. This technique is called “Selective Photothermolysis”. The visible light produced by Ellipse I²PL systems is carefully controlled to ensure the correct pulse length, wavelengths and right amount of energy to destroy the follicle. Ellipse professional hair removal equipment is suitable for all body areas including arms, underarms, back, chest, bikini line, brazilian as well as legs. This treatment offers painless permanent hair reduction delivering smooth skin for both male and females. IPL hair removal using the Ellipse device is extremely affordable, Total Beauty in Goole, East Yorkshire is one of only 2 salons in Yorkshire that has the Ellipse Hair Removal Equipment and our prices are unbeatable. If you would like further information on how Total Beauty can help you achieve the look you desire please call us today to arrange a consultation.